GT_MEASUREMANY (GeoTools -> Build Tools -> Measure multiple objects) : This is a simple command that applies the MEASURE command on a multiple selection of objects. 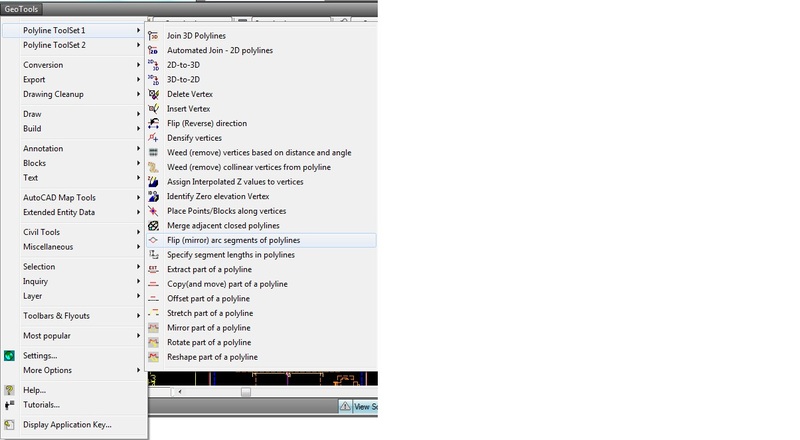 You will be prompted for all inputs as required by the MEASURE command. In addition, GT_MEASUREMANY command also provides the option to place points/blocks at the start and end of the curve - something that we feel even the standard MEASURE command lacks. Perhaps, Autodesk and Bricsys would like to add this into their CAD software in the next release. GeoTools V 11.14 - Minor update. 1. The order of some of the commands in the Polyline, Conversion, Text, Blocks and Miscellaneous Tools menus have been changed. Commands which are popular and used more often are being moved to the beginning of the menu list while the less frequently used ones have been shunted down below in the list. This re-organization of commands is still an ongoing process and is expected to be fully completed in the next couple of updates. There is no change in the number of commands within each tools category, neither has any command been moved from one tool category to another. 2. The GT_ATTEDIT command (Block Tools -> Global Attribute Editor) now allows block attribute increments and decrements in real numbers also. Until now, only integer increments and decrements were possible. 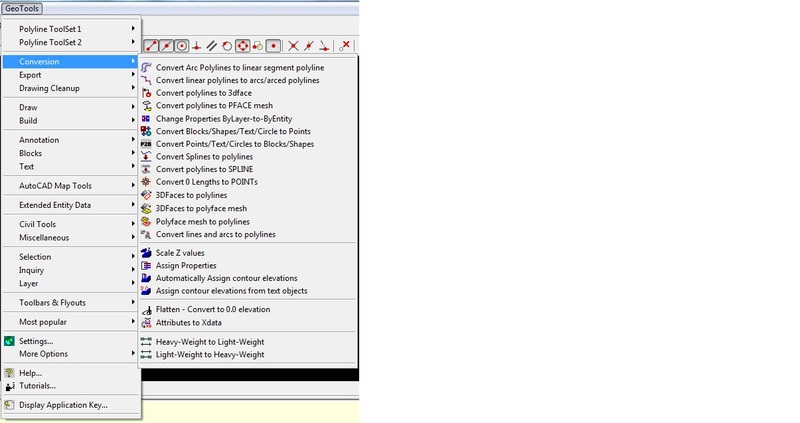 Polyline objects can have smooth curves because they can have arcs or may be be splined or fitted. While curves are often used to design road curves, building geometry etc, it is not possible to practically lay or construct a curve on the ground unless it is approximated by a series of straight lines short enough to create an effect of a smooth curve. It is therefore required to represent the curves (arcs) with linear segments. 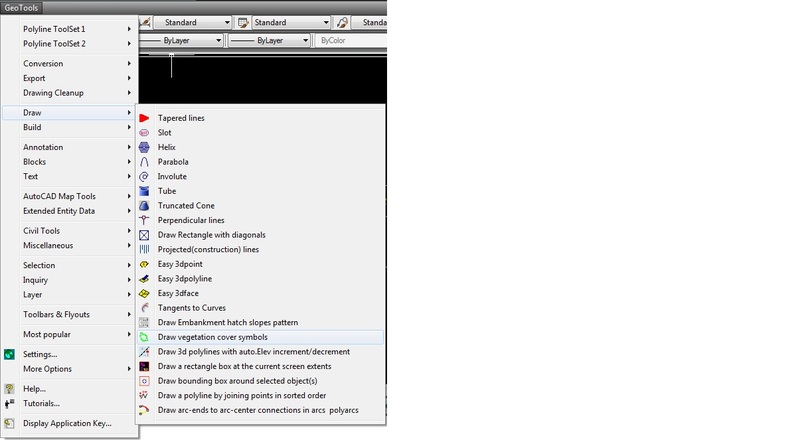 GeoTools provides a few commands to convert curves in polylines and splines into linear segments. In this post, we will examine two commands which can be useful. Minor update - GeoTools V 11.13 released. 1. Some of the GeoTools commands (like GT_ANNOGRID) use supporting DWG files which used to be located in a common folder called 'BLOCKS' under the GeoTools installation folder. Anticipating that commands may need to use their own support files in the future, a new folder called "Support" has now been created under the GeoTools installation folder and all support files specific to each command will be placed in a folder by the name of that command. For example, the support files used by GT_ANNOGRID will now be placed in <install_folder>/Support/ANNOGRID folder. 2. The GT_VEGLINE (Draw Tools -> Draw vegetation cover symbols) now offers 6 pre-defined PAR files which are useful to draw vegetation symbols for (T)rees, (S)hrubs and (H)edges, with scales of 1:200 and 1:500. The names of the files are HPOLY500.PAR, TPOLY500.PAR, SPOLY500.PAR, HPOLY200.PAR, TPOLY200.PAR and SPOLY200.PAR. You can use these files as a guide to set GT_VEGLINE parameters. These are suggested best fits for these vegetation types and scales. If you don't like the parameters, feel free to replace them with your own and retrieve later. 3. The GT_PLARCMIRROR command (Polyline Toolset 1 -> Flip (mirror) arc segments of polylines) would crash in Bricscad if it encountered a light-weight polyline. This has been fixed now. Bricsys India announces special promotion in India valid until March 31, 2011. The prices of all licenses of Bricscad have been slashed by 30% until this period. Includes: ACIS Solid Modeling Editing and VBA. 1 year of maintenance: access to all updates and upgrades during the year. 1 year of technical support by email. E-book (PDF file) "Customizing Bricscad" by Ralph GRABOWSKI. Includes: ACIS Solid Modeling Editing and VBA included. Includes: 1 year of maintenance: access to all updates and upgrades during the year. For Fedora 12 or higher, OpenSuse 11.1 or higher, Ubuntu 9.10 or higher. Bricscad V11 is a full-fledged, mainstream CAD software that is 100% AutoCAD compatible. Bricscad is the only non-IntelliCAD alternative to AutoCAD in the market today and the only one that runs on Linux. Identical user-interface, AutoCAD-like commands, menus, names and procedures and the use of standard DWG format and supporting files like LIN, DXF, PAT, SHX make inter-operability between AutoCAD and Bricscad easy. No loss of data, no translations - all native support for each other. In addition, Bricscad also offer 100% compatibility for Lisp, VBA and ARX/BRX applications. So, any customization you do for AutoCAD will work in Bricscad with little or no change. In addition, we are also giving our GeoTools software FREE with every license of Bricscad purchased during this period. Who are we? Coordinate Systems, Bangalore, is a reseller and systems integrator for Bricscad software in India. We are also a complete CAD/GIS application and product development company with over 11 years of successful track record delivering CAD software projects on AutoCAD/Bricscad in 35 countries. Our GeoTools productivity software, originally written for AutoCAD has been ported to Bricscad, and works identically in both the CAD platforms. As you can see, this is a proposal that is about 5-10 times more affordable than AutoCAD, as good as AutoCAD and far superior technologically than IntelliCAD clones. Let me know more about your requirements and I will be happy to respond with more information.